The mountains of Auvergne, which culminate in rocky peaks at over 1700m / 7000 feet, are the backbone of France's Massif Central. This area of highland is the largest volcanic area in Europe. As the experts stress, the volcanoes are dormant... though not extinct. There is plenty of volcanic activity going on deep below the ground, as is still seen by the hot springs at Chaudes Aigues in the Cantal, where the water comes out of the ground at a temperature of 82°C, the hottest springs in Europe. Nonetheless, there is little reason for alarm, as there has been no volcanic activity in Auvergne for over 7000 years. Traces of the volcanic past are however to be seen throughout the region, not just in the form of the volcanoes themselves, but in the numerous lava flows, volcanic plugs - often capped with castles - and sets of "organ rocks" that form one of the region's remarkable geological features. While the northern end of the province stretches up the Loire and Allier valleys towards the low-lying Centre of France, most of the southern part of the region is hilly or mountainous, with large stretches of land lying at over 1000 metres (over 3000 ft). 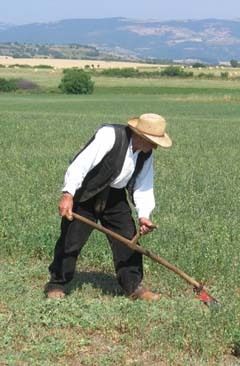 These uplands are penetrated by the valleys of many rivers, most notably the Loire and the Allier which both rise in the south of the Auvergne. Sparsely populated, the Auvergne boasts a fine natural and cultural heritage, including beautiful valleys, large expanses of coniferous forests, and spectacular hillscapes. It is a region much appreciated by ramblers and nature lovers, as well as by people in search of a holiday far from the madding crowd. It is a region rich in history too, with a fine collection of historic dungeons and castles, as well as some of the finest romanesque churches in France, many with frescoes. The small city of Le Puy, famous for its lace-making and UNESCO listed cathedral, is one of the most unusual cities in France, due to the rocky pinnacles that stick up in the middle of it. Of course there are modern attractions too, including a safari park, the Vulcania theme park (illustrating the story of Auvergne's extinct volcanoes, and including 3-D cinema and IMAX), scenic railway lines, cable cars to the peaks of the highest mountains, kayaking and rafting facilities, mountain bike tracks, and much more. The Auvergne Wildlife Park at Ardes sur Couze, near Issoire, is also worth a visit. 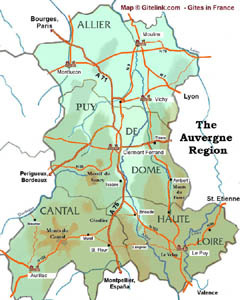 Three main rivers have their headwaters in the Auvergne: the Loire, the Allier and the Dordogne. Though the region is not served directly by any year-round low-cost airline services, Auvergne is an accessible area, and just that little bit closer to Britain, Paris or the north of Europe than the southwest of France and the Mediterranean regions, which it borders to the south and west. By AIR: The Clermont Ferrand airport has direct flights with many destinations in France and a few beyond. Low-cost airline Ryanair fly to Clermont Ferrand from London Stansted in the summer. Other nearby airports served by low-cost carriers are Limoges and Rodez in the west, and Lyon in the east. By ROAD: By road, destinations in the Auvergne are from about 7 to 9 hours' drive from Calais or Brussels, and 4 from Paris. The new motorway link between Paris and Spain, via the magnificent Millau viaduct, passes through the heart of the Auvergne (A 71 in the north, A 75 in the south). The A 89 motorway is an east-west link providing easy access to the Auvergne from Lyon and Bordeaux. By RAIL: Fast Intercités express trains run between Clermont Ferrand and Paris, via Vichy and Moulins, in three and a half hours. Clermont Ferrand also has direct services to Lyon (just over two and a half hours), and rather slow but very picturesque direct services to Nimes and to Beziers. Le Puy en Velay is best reached from Paris by TGV to Saint Etienne, and local train through the Loire gorges thereafter. By CYCLE : The Auvergne is crossed from north to south by French national cycleway V70. This runs from its junction with the east-west European cycle route EV6 (Danube to the Atlantic) at Cuffy, just south of Nevers (Burgundy), to the Mediterranean coast south of Montpellier. The Auvergne section of V70 is due for almost complete opening in 2019; basically it follows the valley of the river Allier from near its confluence with the Loire near Nevers, to Pradelles, just north of Langogne, and close to the river's source. It passes through Moulins, Saint-Pourçain, Vichy, Vic le Comte, Auzon, Brioude, Langeac and Monistrol d'Allier. Following the river Allier almost up to its source, It is the easiest of the north-south cycle routes to the Mediterranean. South of Pradelles, cyclists can follow relatively traffic-free routes through Langogne, then the D906 which slopes gently down from the Col du Thort towards Villefort and on to the Mediterranean plains. 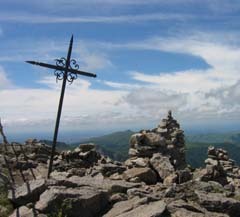 On FOOT : The Auvergne is one of the major hubs of the French national long-distance hiking trail network, the sentiers de Grande Randonnée. 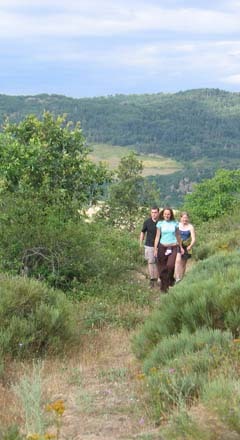 See hiking trails in France. The Limagne and the plains in the north of the region. 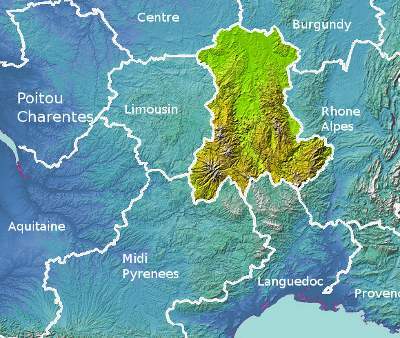 The Monts du Forez in the east of the region, a long chain of uplands broadening out into a high plateau at their southern end. The Volcanoes, craggy peaks bursting through the uplands between the Puy de Dome beside Clermont Ferrand and the Plomb du Cantal in the south west. The Cezallier, high prairie land stretching southwards from the Massif du Sancy, famous for its open spaces, cattle grazing and cheeses. The Haut Allier - where the Allier and its tributaries emerge from the uplands in deep valleys. The Velay - the high plateau around the town of Le Puy, between the Forez to the north and the Cevennes to the south. The mountains of the Margeride, dividing the Cantal from the Haute Loire. The rest of the Cantal uplands, in the south of the department of this name. Kayaking and water sports on the Allier and the Loire. Fishing, coarse and fly, on most of the region's rivers. Hang gliding from the volcanoes. Downhill skiing on the Puy de Sancy and the Plomb du Cantal (fully equipped resorts). Nordic skiing in many places.